Among several closely watched bellwethers of the incipient economic recovery, one indicator in recent months has quickened the pulse of pundits. The “quit rate” has inched up, setting off a round of optimism. “Workers Shed Caution in a Healthy Sign for Labor Market,” trumpeted a Wall Street Journal article earlier this year. “Millions Of People Are Quitting Their Jobs Every Month. That’s Good News,” reported NPR reassuringly. The resurgent quit rate—the percentage of workers leaving jobs voluntarily—may indeed end up being cause for celebration, especially if other economic indicators rise with it. The willingness to quit signals a welcome movement in the job market because it loosens up opportunities and mobility, as well as hints at increased confidence of workers who may be leaving one job before finding another. But the news isn’t all good — nearly a decade of depressed job numbers leaves some experts wondering about what kind of damage has been wrought on career arcs, the psyche of the American worker, and employer-employee relations. It’s been a long haul, after all. 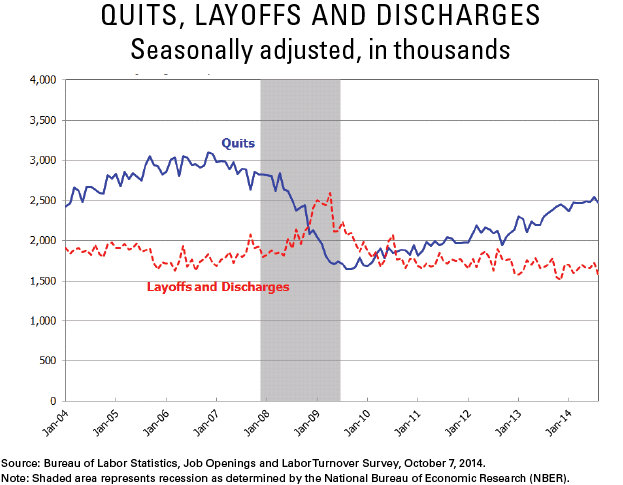 Back in 2006, the quit rate was holding steady around a healthy 2.5% for the private sector. By 2009, it had dipped to 1.4%, according to the U.S. Bureau of Labor Statistics (BLS), and by last year had only recovered to 1.8%. For a while, during the worst of the recession, workers were so fearful about the economy that the number of people quitting dipped below the number being laid off or fired — an inversion of the norm. So when the private-industry quit rate rebounded to 2% in April, many cheered. But the Great Recession has been different from previous downturns. It has loosened ties between employers and employees and eroded loyalty on both sides. The direction of the quit rate by itself — which has remained flat since April — isn’t particularly meaningful, says Wharton management professor Matthew Bidwell, but combined with other metrics, it helps to indicate whether conditions are improving. 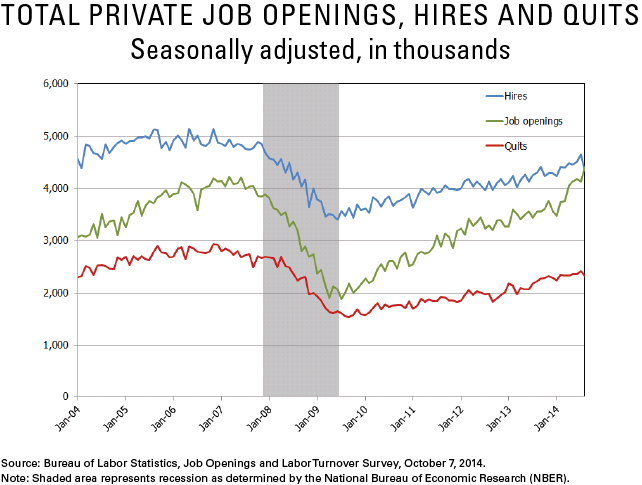 This week, the BLS announced in its Job Openings and Labor Turnover Survey that the August 2014 level held steady at 2% for private industry. But the quit rate has not yet recovered to 2006 levels, much less the peaks reached during the boom years. And at least some of the reason it has risen may take the wind out of the sails of optimists. Quit rates vary by sector, and much of the job growth in this recovery has been in lower-paying jobs like retail and food service, where turnover is generally higher anyway. Additionally, the introduction of the Affordable Care Act has likely emboldened some to work part-time or leave the work force altogether, which could result in a somewhat higher quit rate. Looking at quit rates and other data, economics professors Steven J. Davis of the University of Chicago and John Haltiwanger of the University of Maryland have found that U.S. labor markets have become much less fluid —and that rates illustrating this point have been falling for decades, and cut across geographic, demographic and industry-sector lines. But for workers who feel stuck, now is exactly the time to be looking for a new job, according to Pamela Skillings, author of Escape from Corporate America: A Practical Guide to Creating the Career of Your Dreams and president of career consulting firm Skillful Communications. It’s important, McGrath notes, for deeply unhappy workers to not wait until they reach the slam-the-door-and-walk-out stage. “That happens to people; they leave before they manage to find another job or before they’ve figured out how to map a job strategy,” she says. Cappelli adds that it’s never a good idea to leave a job before landing another one. “The market shows distaste for unemployed people looking for jobs,” he notes. The article is a very good read. However the data points are not telling the whole story. I’m an owner of a search and recruitment firm specailizing in a niche manufacturing sector. We work with highly skilled/ trained professionals routinley. One of the greatest if not the greatest challenge we see is the housing market has not fully recovered in all areas. Professionals will make a change, but cannot get from under the house in quite a few areas. Until this gets resolved we are still pushing the wagon up an incline.